Rainbow Riches luck of the irish is unique in many ways and is proving to be more and more popular amongst players. For starters is has the pots, as usual it's bronze, silver and gold, which start at the same values as Rainbow Riches Pots of Gold. The first thing you'll notice with this machine is how slow it spins, it appears that on each spin only a dozen or so symbols will drop past and it lands very slowly, secondly is that it only has 4 reels instead of the usual 5! There are no wilds and only 5 winning symbols on this machine, as you can see on the right. A 4 of a kind will pay a relatively good win compared to most Rainbow riches slots and also offers a bonus repeat chance where the win can be multiplied sometimes 4 or 5 times! 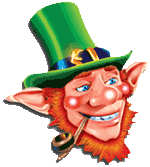 The pots are awarded by getting a row of 4 'luck of the irish' symbols on any of the 3 winlines, and the free spins feature is triggered by getting 3 of the symbols. It is possible to get the free spins and the pots at the same time (check out the video in our Rainbow Riches Videos section). The free spins can also re-trigger and offer the pots during the free spins too. This has a very different look and feel to it than most rainbow riches slots but it's definitely proving popular and will no doubt be a future classic for Barcrest's 777 cabinet.